What you see above is an official model of Apple's proposed future home, the spaceship-like, circular building which will house the company's Silicon Valley employees. The Mercury News site was given an exclusive look at the plans, which the company hopes, subject to approval from Cupertino City Council, will be completed by 2015. The massive Apple Campus 2 building will be housed on a 175-acre plot of land and will feature a black roof, laden with solar panels, and underground parking. The four-storey building, which will house some 14,000 employees and cost around $5 billion to build, will be shielded from the outside world by a veritable forest of trees. 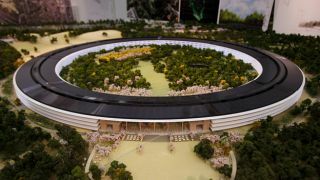 Plans for the new HQ were first unveiled back in 2011 by Steve Jobs, in what is thought to be his last public appearance. "There isn't a straight piece of glass on the whole building... and as you know if you build things, this isn't the cheapest way to build them," the iconic tech visionary proudly told Cupertino City Council at the time, vowing to build the world's finest office. Head over to Mercury News for the full gallery of images. Here are 8 mad technology HQs from around the world. Fancy working here?